When you visit the Islands of Hawai`i or a mainland Hawai`ian festival, you’ll likely hear a unique style of music. Slack-key guitar is a fingerstyle genre of guitar music that originated in Hawaii. Its name refers to its characteristic open tunings: the English term is a translation of the Hawaiian kī hōʻalu, which means “loosen the [tuning] key”. Most slack-key tunings can be achieved by starting with a guitar in standard tuning and detuning or “slacking” one or more of the strings until the six strings form a single chord, frequently G major. In the oral-history account, the style originated from Mexican cowboys in the late 19th century. These paniolo (a Hawaiianization of españoles—”Spaniards”) provided guitars, taught the Hawaiians the rudiments of playing, and then left, allowing the Hawaiians to develop the style on their own. 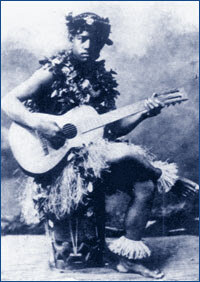 Many Hawaiian songs and slack key guitar pieces reflect themes like stories of the past and present and people’s lives. But it is the tropical surroundings of Hawai’i, with its oceans, volcanoes and mountains, waterfalls, forest, plants and animals, that provide the deepest source of inspiration for Hawaiian music. These currents run deep in slack key guitar playing, as accompaniment to vocals, as instrumental composition or as interpretations of vocal pieces. Slack key guitar music is sweet and soulful, and it is said that slack key is drawn from the heart and soul out through the fingers of each player. Like blues, slack key guitar is very flexible. Often, the same guitarist will play a song differently each time, something using different tempos, and even different tunings. As each guitarist learns to play slack key, they find their own individual tunings, repertoire, tempos and ornaments. It is a very individualistic tradition and, as one can hear from different recordings, each guitarist plays quite differently from the others. Celebrate Hawaii’s Statehood Day with 16 talented artists, great food, island crafters, and freebies all day long. Multi-Grammy Award winning Hawaiian concert series presents today’s top Hawaiian musicians hosted by George Kahumoku Jr. and his Slack Key Show Ohana. Family-friendly evening of art and live music. September 2017: Dayton Watanabe (Hawaiian slack key guitar and contemporary music) in the second floor Sculpture Lobby. 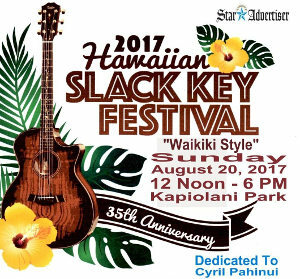 Event will feature up to 16 performing artists in the Slack Key Guitar Genre including award winning artists and newcomers. Also appearing will be a couple of special guest from Hawaii and the mainland. The event will also feature “Made In Hawaii” products and favorite foods and snacks. Throughout the day, the festival will also be giving away many artists’ cds, festival t-shirts and a brand new Taylor guitar to some lucky winner. Event will feature up to 16 performing artists in the Slack Key Guitar Genre including award winning artists and newcomers. Also appearing will be a couple of special guest from Hawaii and the mainland. The event will also feature “Made In Hawaii” products and favorite foods and snacks. Throughout the day, the festival will also be giving away many artists cds, festival t-shirts and a brand new taylor guitar to some lucky winner. General admission tickets are $27, $37 and $57. Aloha! 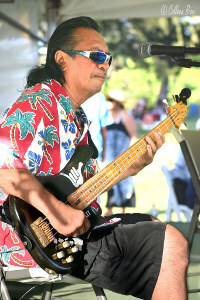 The 9th Annual Seattle Slack Key Festival sponsored by Hawaiian Airlines features many of Hawai’i’s Master Musicians including: Ledward Kaapana, George Kuo, Jeff Peterson, Kunia Galdeira, Sonny Lim, Kamuela Kimokea, Mike Keale, Ikaika Marzo and more. Emcees Skylark Rossetti and Braddah Gomes and Hula Halau Pulamahiaikelikolehua add to this fantastic line-up. We’ll also enjoy Hawai’i’s tropical flowers and prize drawings.